SharePoint communication sites share news, reports, files, links, and other information in a modern dashboard approach to rolling up content. Communication sites are responsive and can be viewed from any device and are used to broadcast communication-based information out to organisational teams. For users that are constantly creating corporate communication for their teams in SharePoint, it is important to streamline the content creation process. Whilst the process of creating a page or a news post using the modern SharePoint experience is relatively simple and definitely more user friendly than classic mode, it is still not as simple as using Microsoft Word. Most users will use Word to generate their content and then cut-n-paste the content in to their SharePoint site. Who could blame them; Word is still the easiest way to build page and new post content and is the most familiar editing toolset in the world. Once the article is written in Word and ready for publishing, the user will set about carefully crafting the new content in the browser from Word. Images are saved, uploaded and reference within the HTML for classic pages. For the modern experience in SharePoint, user still need to create pages and add web parts to the page. Granted, it is easier with the modern experience but users shouldn’t have to know which web part to add to the page to get their article published. What if there was a way from going straight from Word to SharePoint modern page/news post to your Communication site? Well now there is. Live Publish has been available in the market since May 2015 and has been assisting users to create classic SharePoint content and wiki pages ever since. It uses the new Office Add-in model and leverage a provider hosted solution to help integrate SharePoint On-premise and Online right within Microsoft Word. In the graphic below, you can see that your SharePoint site is incorporated and accessible directly from within Word as you are editing your content. The process of creating modern content for your Communication and Team sites in SharePoint Online has never been easier. Load the add-in and register your Microsoft login for a 30-day or 30-publishes trial. Add your SharePoint Online site through the dashboard – Add web location. Once your SharePoint site is loaded, you’re free to create modern pages and news posts by selecting the document type, location to publish to and selecting publish. Our support for different types of content within Word is extensive. Embedded content like videos, Excel charts, PowerPoint slides, SmartArt and WordArt are all supported, in fact, we support all first-class word objects and upload these for the user. We built full metadata support within the panel to ensure the user could profile the content type data in full within Word before sending it off to be published – this is extremely convenient and powerful as the user does not need to load a separate screen to check-in their content. 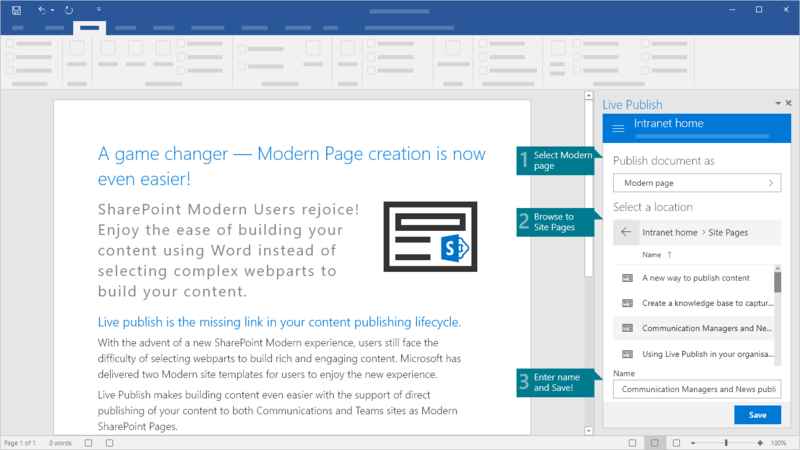 If you’re a user of a modern SharePoint Communication or Team sites or simply building modern content in Classic SharePoint Site Pages libraries, please consider Live Publish as an easier way to build and manage your modern content.